Timothy Ash: Will Ukraine go off track with IMF program? 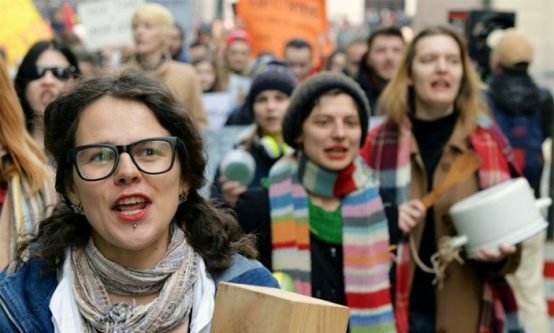 In May the Geneva-based Women’s International League for Peace and Freedom (WILPF) submitted a written statement to the UN Human Rights Council addressing the impacts of IMF macro-economic reform programmes on women’s rights in Ukraine. The statement outlined various ways in which the recent IMF-demanded Ukrainian economic reforms (see Observer Spring 2015 and Winter 2016), have “violated women’s economic and social rights and contributed to the feminisation of poverty and deepening of gender inequalities”. WILPF pin-pointed three specific IMF policy conditions, fuel subsidy cuts, cuts to the public sector and tax policies, as having significant gendered impacts. While the IMF has repeatedly argued that fuel subsidies “are a costly approach to protecting the poor due to substantial benefit leakage to higher income groups”, WILPF’s statement pointed out that cutting fuel subsidies without adequately considering impacts on the poor and women can have disastrous consequences for these vulnerable groups. Since the implementation of the loan programme in Ukraine, the state statistics committee reported that energy consumption decreased by 30 per cent, which WILPF asserts has significantly diminished living standards across the country. As women make up the majority of the poor and unemployed in Ukraine and rural women face particularly harsh living conditions, these fuel subsidy cuts can disproportionately hurt women. In terms of women’s participation in the labour force, the statement noted that the IMF programme entailed overall plans of a 20 per cent reduction in the civil service workforce, including 12,000 social workers in 2014 and 25,000 healthcare professionals in 2015. The statement stressed that these policies directly disadvantage women in particular as “women comprise more than 75 per cent of the civil service, predominately in [more vulnerable,] non-managerial positions”. In addition to the loss in employment opportunities, unpaid elderly, health and child care burdens shift disproportionally to women, straining their time and access to the labour market (see Bretton Woods Project briefing October 2016). The sharp decline in state spending since 2013 has caused the numbers of hospital beds to be reduced, schools to be closed and childcare assistance to be cut. Under the IMF programme Ukraine reduced tax rates for large corporations, while increasing tax on consumption, labour and medium and small businesses. The statement argued that women are disproportionately impacted by these changes because “there are more women among small entrepreneurs as compared with men (53% in 2011, according to the World Bank) and, due to a number of constraints, female-headed enterprises are less profitable regardless of the sector of economic activity.” The IMF’s encouragement of corporate tax competition in a so-called ‘race to the bottom’ has been the subject of ongoing civil society concern, as expressed in a recent Oxfam paper. The obligation of states to respect, protect and fulfil economic and social rights in the context of macroeconomic reform programmes under IMF guidance has only recently become the subject of discussion in UN human rights spaces. So far the Human Rights Council, the UN’s principal intergovernmental body responsible for promoting and protecting human rights around the world, has largely overlooked such programmes in its regular triannual sessions. Notable exceptions have been the recent work of some special procedure mandate holders, such as the upcoming report of the independent expert on international order on human rights impacts of the economic policies of the IMF and World Bank. The independent expert on foreign debt is also in the process of producing guidance on human rights impact assessments of economic reform programmes, which is still open for consultation. WILPF’s recommendations echo calls by these and previous special procedure mandate holders to design macro-economic reform programmes from a human rights perspective and to address their negative impacts on women and the marginalised. Madeleine Rees of WILPF commented that “until the IMF fully recognises how its policy recommendations often disproportionately hurt women and changes its orthodox approach, it will continue to undermine gender equality and women’s rights”.